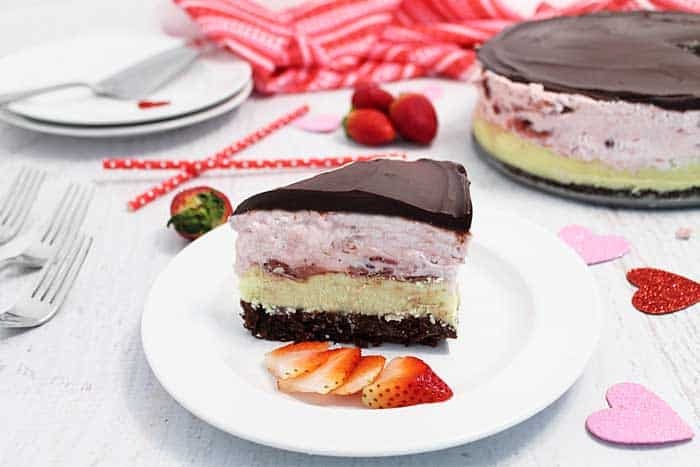 A Neapolitan Cheesecake from the Secret-Layer Cakes Cookbook, brings you chocolate, vanilla and strawberry goodness all in one creamy, rich cheesecake. 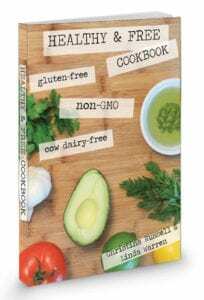 I received a free copy of the cookbook to review and make one of the fabulous recipes found within its covers. Wow! is all I can say! All photos and opinions are 100% my own. 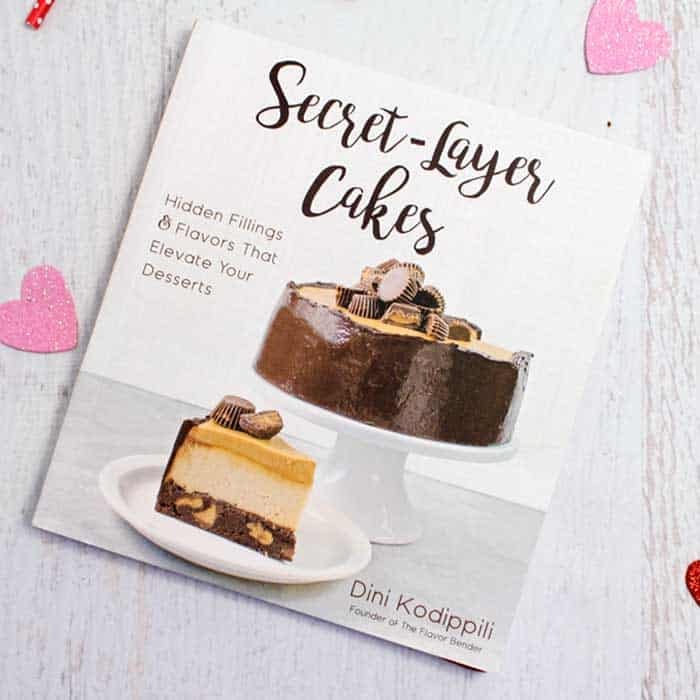 One of my Facebook friends, Dini Kodippili, wrote a cookbook called Secret-Layer Cakes, now available on Amazon, and asked us to make one of the recipes and give a review on her book. I received it right before Christmas and hadn’t had a chance to look at it until now. And when I did – Wow! There are so many beautiful cakes in this book that I could make them for special occasions for the next several years. And they all look super delicious too! 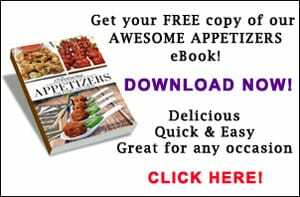 There are so many recipes to choose from, like Pumpkin Spice Latte Cake, Chocolate Explosion Ice Cream Cake, Tres Leches Boston Cream Cake, and Fudgy Pistachio Baklava Cake just to name a few. 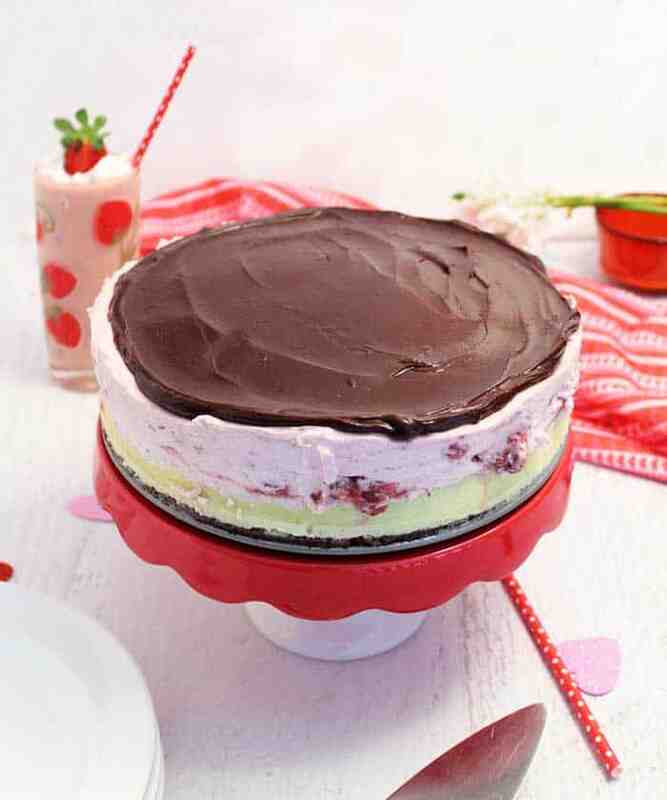 I chose this Neapolitan Cheesecake – one, because cheesecake is one of my favorite desserts (I can’t get enough of my Carrot Cake Cheesecake), and two, because who wouldn’t love layers of dense chocolaty brownie, creamy vanilla bean cheesecake, light and sweet strawberries and cream and thick rich chocolate ganache. Are you with me? I have to say that the cakes in this book are desserts that are made with love and care and do take some time but for a special occasion they are well worth the effort. I started this cake two days ago, which is why my post is a little later than usual, and just got to try it last night. OMG! It is so awesome! My husband just kept sighing with pure pleasure after each bite. So here’s the download of just what you have to do to create this masterpiece. 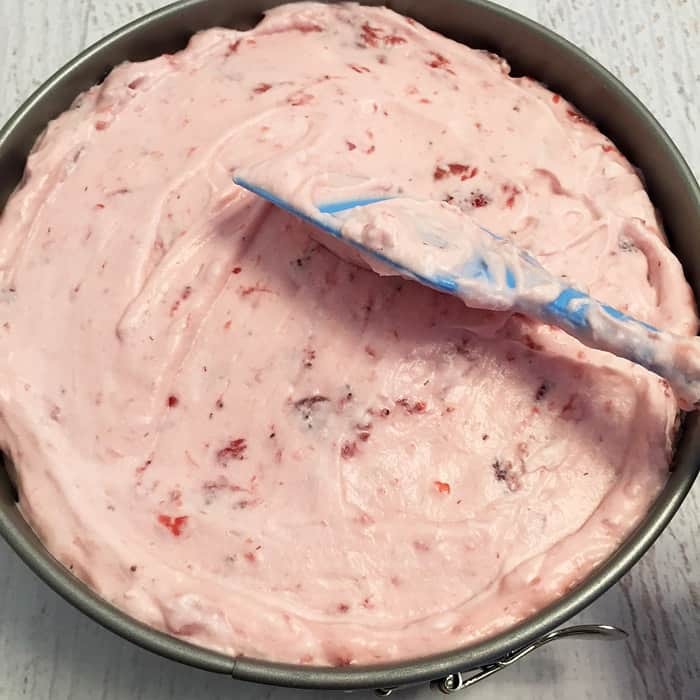 It isn’t that each step is hard, it’s just that the cheesecake layer has to chill in the refrigerator overnight and then the strawberry layer has to gel well before putting on the ganache, hence, two days. First, mix up the brownie layer and bake. Super simple. When the brownie layer is cool, whip up the cheesecake layer. Just look at all those vanilla bean seeds that give the cheesecake a ton of flavor. Chill overnight. Next, the strawberries are cooked on the stove with some sugar, cooled and mixed with whipped cream. I could eat this layer all by itself but I just might fill my Mocha Cheesecake Cookie Cups with this light and sweet mousse-like mixture and serve for Valentine’s Day. Pile it on top of the cheesecake layer. I put the ring back around the cheesecake in order to keep the filling in place until it chilled. Dini didn’t call for that but it worked better for me and protected it while it was chilling in the fridge. Finally the rich chocolate ganache topper. And by this time I was just dying to try a bite. And it turned out looking so delicious and just like her photo shot in her book. 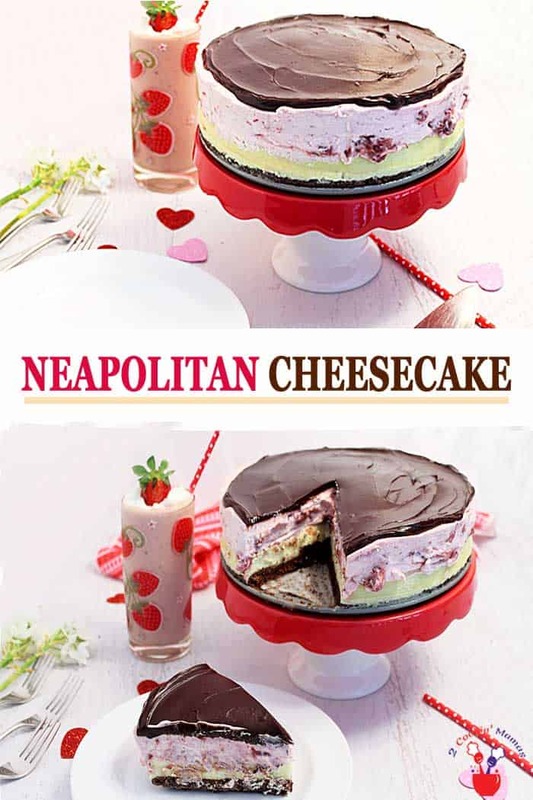 The Neapolitan Cheesecake would be perfect for a Valentine’s Day treat for your special someone. I think next time I might even decorate the top with strawberries for that extra special touch. Give it a try and let me know what you think. And don’t forget to register to win your own copy of her fantastic Secret Layer Cakes Cookbook below. 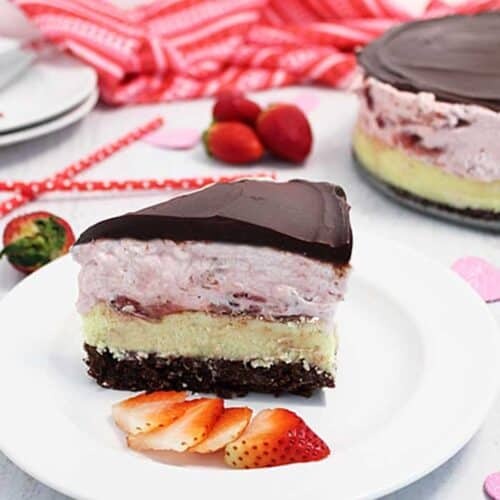 This Neapolitan Cheesecake has 4 layers of deliciousness - dense chocolaty brownie, creamy vanilla bean cheesecake, light and sweet strawberries and cream and a topping of thick rich chocolate ganache. OMG! What's not to love? Preheat oven to 350 degrees. Grease an 8” springform pan, bottom and sides, with butter and line bottom with parchment paper. Dust sides with flour. In a microwave safe measuring cup, melt chocolate and butter in microwave using 30-second increments and stirring in-between, until completely melted and smooth. It takes about 1 minutes. Combine the chocolate mixture with sugar, salt and vanilla and whisk until combined. Add eggs, one at a time, whisking in-between until smooth and creamy. Pour into prepared springform pan and bake for 15 minutes. Remove to wire rack to cool. While brownie layer is cooling, make cheesecake batter. Using your electric mixer, whip cream cheese, mascarpone cheese, cornstarch and sugar together until creamy and smooth. Add whipping cream, salt and vanilla bean and continue to whip until well mixed. 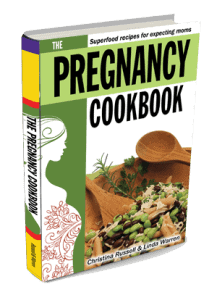 Add eggs, one at a time, mixing on low speed until fully incorporated. Do not overmix! Pour batter over cooled brownie layer. Wrap bottom of springform pan with aluminum foil and seal it well. 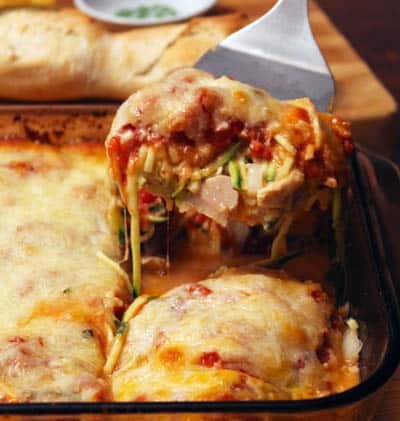 Place in a large pan filled with hot water that reaches about ½ way up sides of pan. Bake for 60-70 minutes. The cheesecake will be just a little jiggly when you gently shake it. Turn oven off, leaving door ajar, and let cheesecake sit for another 30 minutes in oven. Remove from water bath and let cool on wire rack until room temperature, about 4 hours. Loosen the sides of the springform pan and remove. 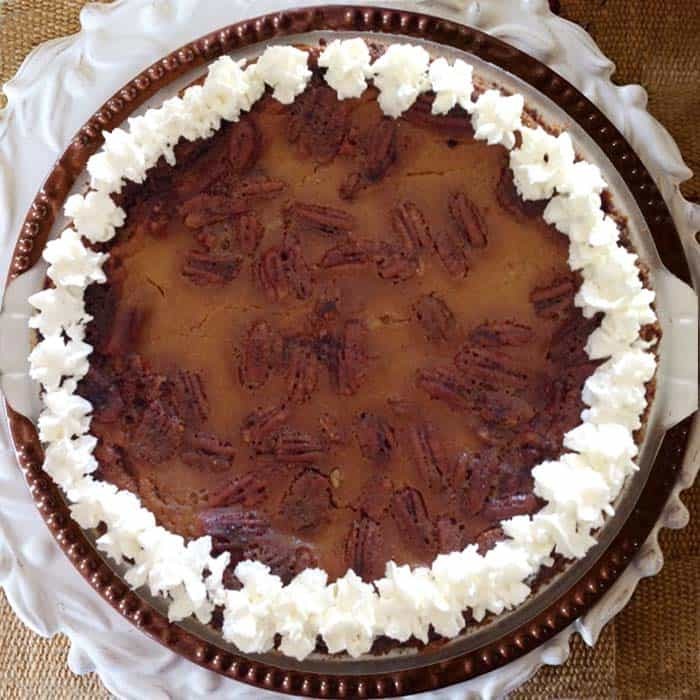 Cover the cheesecake and place in refrigerator overnight. Pour 3 tablespoons water into a small bowl. Sprinkle gelatin on top and let side for 10-15 minutes. In a medium saucepan, place strawberries and sugar and heat over medium heat, stirring often. Bring to a boil then turn down heat and let simmer for 20 minutes. 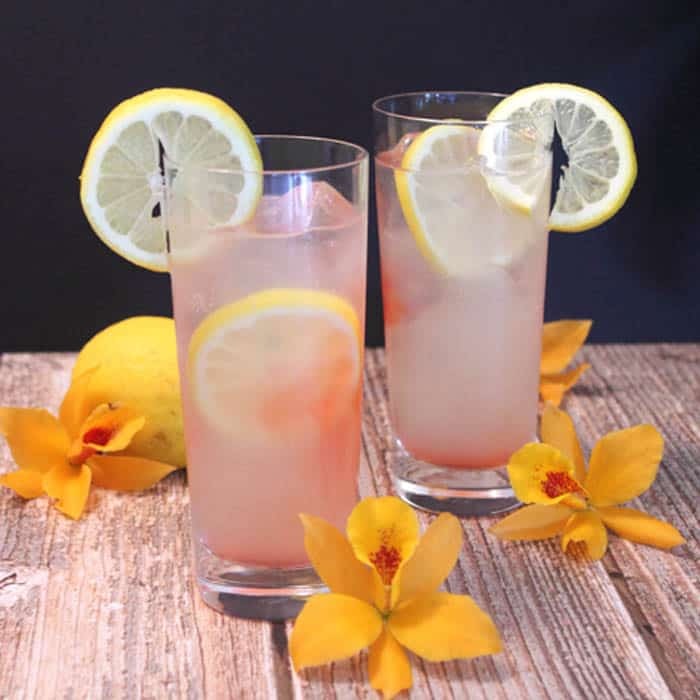 Liquid should be syrupy. Mix cornstarch with remaining 3 tablespoons hot water and stir to dissolve. Add to hot strawberry mixture and let cook several more minutes until the mixture has thickened. Remove from heat and add gelatin. Whisk to dissolve gelatin then transfer mixture to bowl to cool. When the strawberry mixture is cool. Whip whipping cream in a cold bowl until it forms very nice soft peaks. 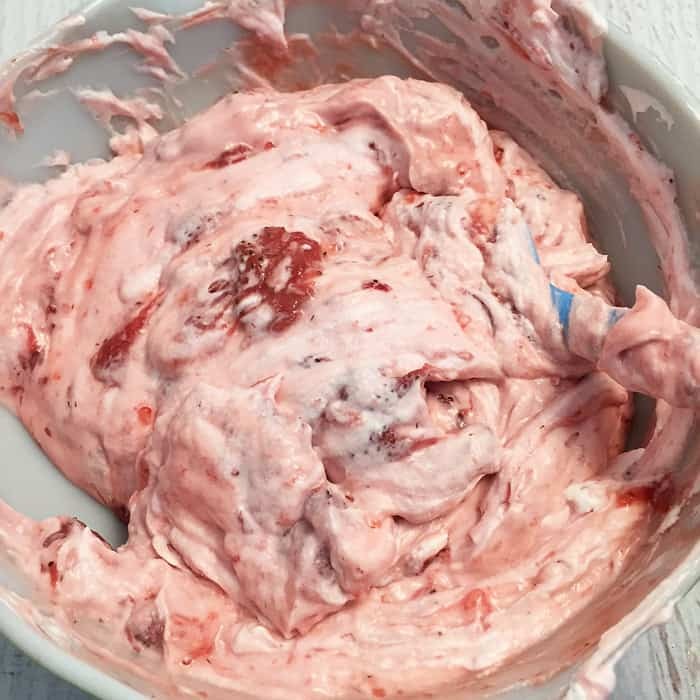 Fold whipping cream into strawberries. 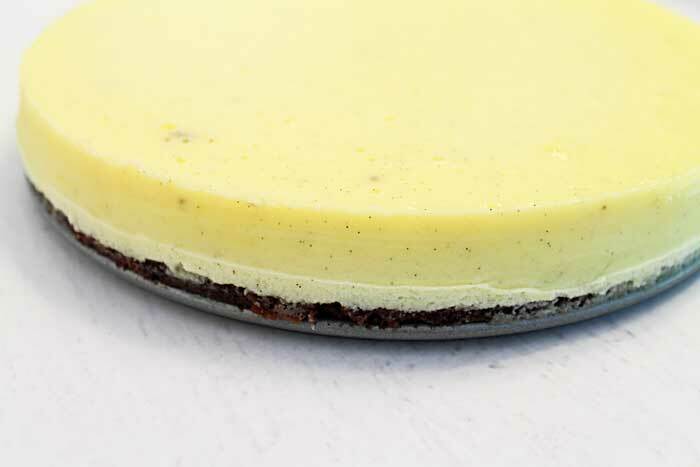 Remove Cheesecake from refrigerator and place springform ring back around cheesecake. Pile on the strawberry mixture and smooth top. Refrigerate until layer has gelled. In a microwave safe measuring cup or bowl, combine chocolate chips with whipping cream. Microwave in 30-second increments, stirring in-between, until melted and smooth. Let chocolate cool until it is of spreadable consistency. 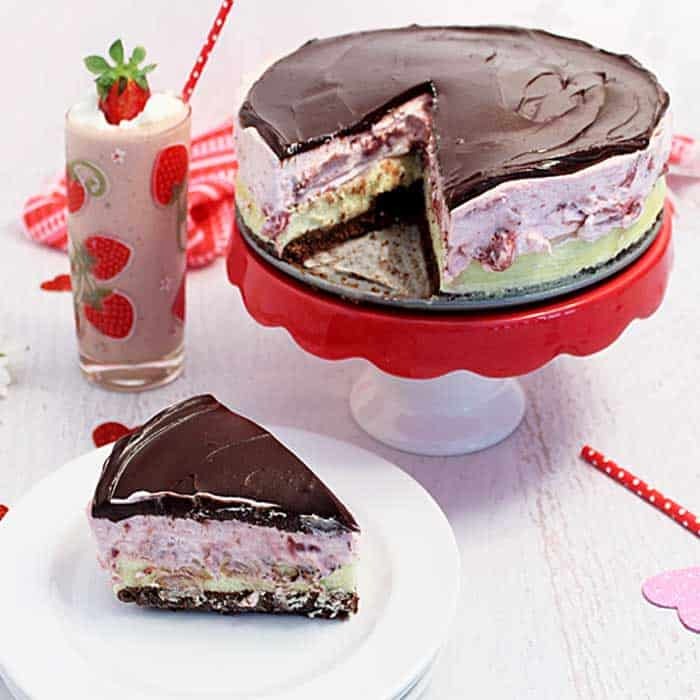 Take cheesecake from refrigerator and remove springform ring. 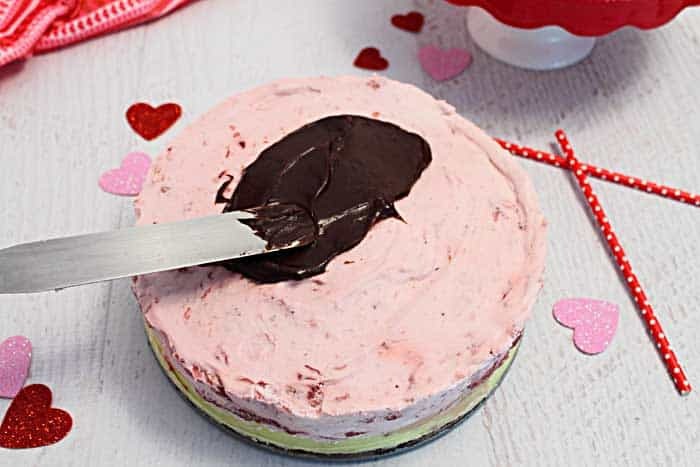 Spread the ganache over the strawberry layer. Let the chocolate layer set. Total time does not include the overnight chill time for the cheesecake layer or the 1-2 hour chill time for the strawberry layer.